Another name is checked off my Christmas list! 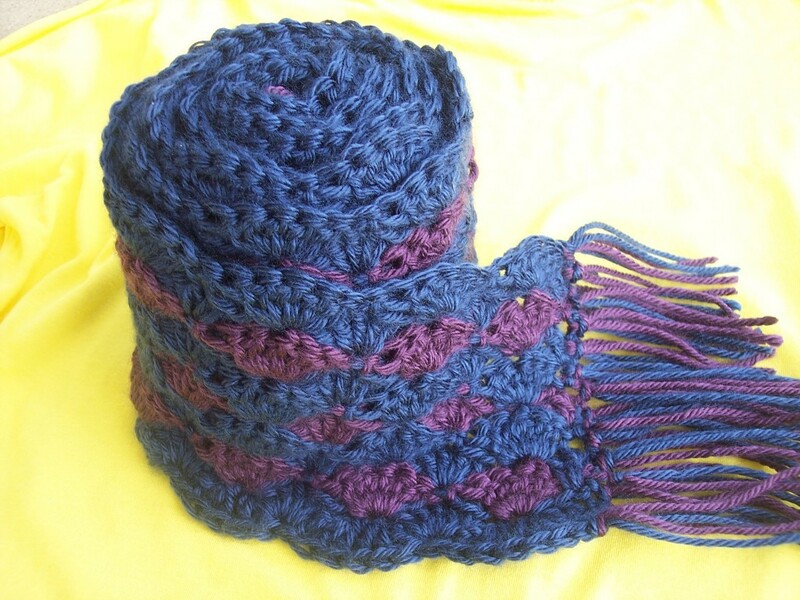 And this free crochet pattern for this scarf is one that I am most proud of. I will be glowing with pride when I give this gift away <3 Enjoy the pattern! Remember to share pics with me through my Facebook Page. Row 1: Change to J/10 6.0 mm hook. SC in 2nd CH from hook. **Skip 2 CH, 5 DC in next CH, Skip 2 CH, SC in next CH. Repeat from ** across the CH. Row 2: Slip stitch into the oposite side of the CH (Doing this so the Chain isn’t on the edge of the scarf) CH 3, 2 DC into same stitch ** SC into the bottom of the middle DC from first Shell on opp,osite side 5 DC into the middle of the SC from oposite side, **SC into the bottom of the next middle DC from opposite side, 5 DC into the middle of the next SC from opposite side. Repeat from ** across. 3 DC into last stitch. You should now have the Shell stitch going across both sides of your CH. Keep working on this same side. Row 3: Turn, SC into same stitch, ** Skip 2 stitches, 5 DC into next stitch, Skip 2 stitches, SC into next stitch. Repeat from ** across. 3 DC into last stitch. Row 5: Turn, SC into same stitch, ** Skip 2 stitches, 5 DC into next stitch, Skip 2 stitches, SC into next stitch. Repeat from ** across. Row 7: Turn, SC into same stitch, ** Skip 2 stitches, 5 DC into next stitch, Skip 2 stitches, SC into next stitch. Repeat from ** across. Row 9: Turn, SC into same stitch, ** Skip 2 stitches, 5 DC into next stitch, Skip 2 stitches, SC into next stitch. Repeat from ** across. Row 11: Turn, SC into same stitch, ** Skip 2 stitches, 5 DC into next stitch, Skip 2 stitches, SC into next stitch. Repeat from ** across. Add fringe to the ends! I did this by cutting 8 inch strands.. I would insert my hook through the end of the scarf, wrap 2 strands around hook, pull through to form a hoop, pull the ends of the strands through the hoop. And TUG! I just finished this beautiful scarf last night!! I printed out the pattern about a week ago, and it is already finished. This is the 2nd thing I’ve ever crocheted, so I’m sure a more experienced crocheter could make it faster! All the time I’ve been working on it, I’ve been trying to decide who to give it to…when I put it on – there was no question!!! I’m keeping it for myself!!!! It is so comfortable; it doesn’t even come close to comparing the comfort level of the first scarf I made when attending a 2 evening Crochet Class!!! I used basically the same colors as in the photo, except the violet color is lighter (labeled as “Orchid”). I also used Simply Soft. I wish I’d read the comments before starting, because I wasn’t sure how much yarn I’d need. After I did a few rows I panicked and went out and bought 3 more of these same colors!! I’m sure I’ll find some use for them at some point. Thanks Corina for a really beautiful, soft and squishy scarf!!!! How much yarn did it end up using? I love this 🙂 I’m planning on adapting this pattern for a throw blanket! how long is this when finished? Im sorry Sarah, I have no clue how long it is.. I don’t have the scarf either or I would measure it up real quick. 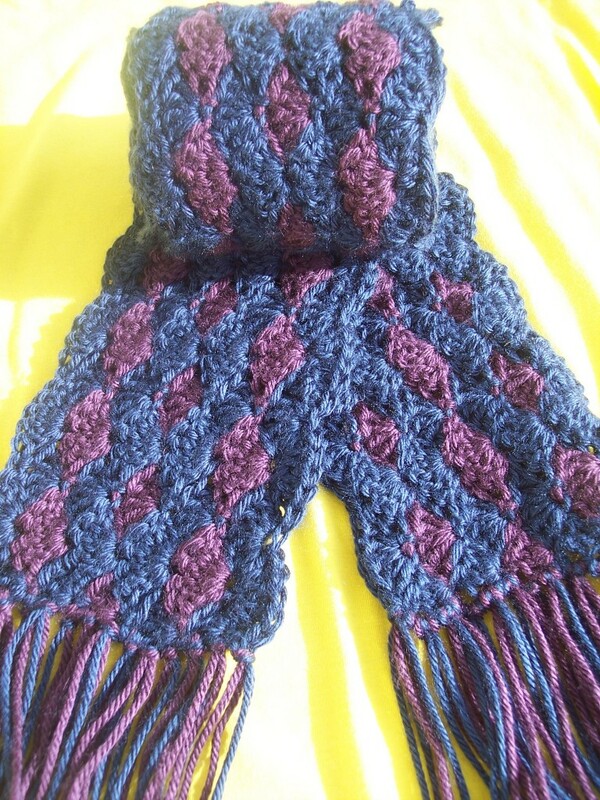 I made your scarf and love the pattern.Thanks for sharing. i’m going to make a shawl with out the fringe i think and a lap and full afghan for by starting like you did gives the finish edge and when you finish how ever long you make them it looks the same at each end. I am working on this scarf in dark grey and dark red. It is looking good! I am curious if you have a hat pattern that matches? Thank you for the pattern. I will post to your Facebook when I finish it. I don’t and honestly never thought about it til now! Maybe I will be able to work one up before Christmas. Okay, sounds like fun! One more quick question, your granny slouch hat pattern, how many skeins does it take? I was looking at that one to complement this scarf and need to know if I will have enough leftover yarn. Thank you for the quick response! For how many skeins.. it would depend on what kind of yarn and size of skein you use. But really…. the hat doesn’t take a lot of yarn. I love this pattern! I am working on a scarf for a toddler and started with 100 chain and it is perfect! Using red and white and it really looks good!! Thank you for sharing! Than you so much for sharing this pattern. I am 75% done my first one already envisioning a ton of Christmas scarfs in bright and personable colors. I have been crocheting for about 30 years and I anticipate it taking me about 5 hours of corchet to make this. Very easy and enjoyable crocheting. 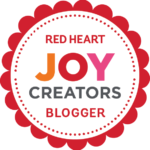 I am using Red Heart Soft in Berry and Wine and LOVING IT! I make and donate prayer shawls to my church, this is so pretty I’m going to make it wider for a shawl. We rely on yarn donations for our shawls so I never know what yarns I’ll be using. This will be great for using up those odds and ends that we always seem to have an abundance of, thank you so much for sharing your pattern and talent.